When M brought back this story from the party where she’d met this person, I thought about how, for us, our “model” — the way that our family runs — is an accomplishment we’re proud of. Before our son was born in late 2009, M and I spent some time thinking about how to design our lives, at least during the early parts of his life, based on three principles: 1) We wanted to spend time together at times of the day when we could be at our best, so that the three of us could be together and so he could see us as a couple; 2) each of us wanted to be his primary caregiver; and 3) we wanted to minimize how much money we spent on outside child care. What did this mean in practical terms? It meant that we both decided to go from full-time jobs to part-time ones, and that we would spend the bulk of our time together as a family in the mornings. Both M and I are fortunate enough to be able to work from home for organizations that are amenable to flexible arrangements, and my company said I could work in the evenings, which is when I’d be doing a lot of my work anyway (with the expectation that I’d be available for phone calls and return email during the day). That left the afternoons for M’s job. So for the first 15 months of my son’s life, we were all together on weekday mornings; M worked from 1 to 5, when the baby and I were together; then a brief window when I cooked dinner and we ate, then I worked from 8 until midnight while she put him to bed. Those were the bare bones of our system from the beginning. It sounds as if it’s just a daily schedule, but the much broader consequences have become clearer now that we’re 19 months into our new lives as parents. That’s also the reason why we won’t stop talking, at least any time soon, about how the family is structured — I also find it to be an interesting tool for looking at the assumptions that people (including me) make about men, women, and families. For one thing, our schedule put us a bit out of synch, time-wise, with other families. There aren’t many families around to socialize on weekday mornings. Also, my working in the evenings on a regular basis put me more out of synch with M than I anticipated. The weekend evenings are our only opportunity to be together, but they’re also my only opportunity to go to sleep early. Also, though we never tried to achieve gender equity in the division of household labor, the schedule has required some shuffling of tasks. I do regularly scheduled baby care for a big chunk of nearly every day, and I also do the food shopping and cooking. Nevertheless, I’m glad we didn’t start out with gender equity as a goal — given the lives we’ve lived with the baby we have, I can say confidently that if we had, we’d feel like failures now. One reason is that he nursed at night until he was 17 months old and wasn’t a very good sleeper, so M got much less reliable sleep than I did. I also didn’t expect to encounter gender-based tensions that range from the amusing to the annoying. There’s the way, because of the breastfeeding, that M picked up more of the childcare on an hourly basis. If gender were purely a social construction, splitting roles and tasks evenly would seem doable, but you can’t split biology. 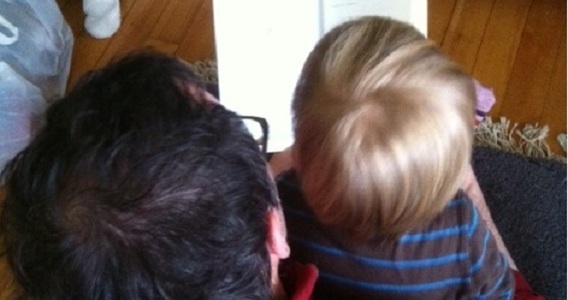 One recent afternoon, I was with my son at a playgroup where I’m the only dad. Three of the moms were nursing their babies, which registered with my son, who began calling “mama, mama.” Not only couldn’t I nurse him, he didn’t turn to me for a hug; there was simply no way I could substitute what he needed. To that point, I hadn’t realized how invested I was in the notion that I could substitute. I could distract him, provide him something else, but his emotional need at that moment was hers to fill. Stay-at-home, full-time moms have been impressed that I know as much about him as M does and wished their husbands knew the same. I’ve taken that as a compliment. But whether or not he ate an egg in the morning is merely information; what matters more are the flows of emotional energy that we keep circulating between us. Any new parent is going to have a couple of good stories about an encounter with the inflexibility of the culture. Here’s one of mine. My son is two, three weeks old. M’s going out the door to a post-partum support group and gets frustrated that I’m not helping her get out the door. What am I doing? I’m washing dishes, which I’d taken over late in her pregnancy, along with cooking, walking the dog, taking out the trash, doing laundry. At the time, my reaction was to feel abandoned and taken for granted. Where’s my post-partum support? We talked through that one, and it was valuable to point out how organized support, by default, goes to women. In an environment where gender roles are getting re-sorted, support should also get spread around. But men, though they may be accepted as caregivers, are still invisible. On a trip to the hardware store, the clerk looked at me with my son in my arms. “You’re on vacation today, I guess?” he asked. From his perspective, an adult man doesn’t take care of children on a normal weekday. It was a small moment that stuck with me: this is how I must look. Like I’m on vacation. Or unemployed. Through a local birth education and perinatal support nonprofit, M and I met and became friends with a set of parents, like us, with new babies. An offshoot of this group was an email list for announcing playgroups and meet-ups. The list became, de facto, a moms’ list, which means that my name wasn’t on it, even though many of the individual moms knew that I’m a regularly scheduled daytime caregiver. By the same token, I knew these activities occurred, but never thought to go. Finally, something clicked. “Can I get on the list?” I asked one of the playgroup organizers. “Sure!” she said. Every little bit of heightened visibility has helped. M thinks I could use more parenting connections like these; I respond by saying that only a woman would miss the social connections, but I say that half in jest, because I wish I wasn’t isolated. When a friend organized a weekly meet-up at a local playspace, I was such an enthusiastic attender that although my friend is no longer going, I still am, hoping that someone I know, mom or dad, will show up too. At the same playspace I’m often the only adult male, which has led to some interesting, fun play interactions with little boys. Otherwise, I’ve solved the absence of scheduled social gatherings by taking up that part of American masculinity in which solitary pursuits, preferably into the wilderness, are acceptable, so we often go for bike rides or hikes. Part of this, I admit, is self-protective. A man in the woods with his son is a man in the woods with his son; a man in the supermarket with his son is either unemployed or giving his wife a break. But I’m doing my family job. And I also have a job, which makes my hybrid situation even more unusual. To the degree that I have a professional identity and have made some professional sacrifices to care for a child on a regular basis, I feel like I have more in common with moms than dads. This is a good thing, because I haven’t found a community of dad caregivers where I live. Perhaps that’s an impossibility. I’m sure they’re out there, going for hikes with their kids and hanging out at home, trying to spend time in places that won’t conspicuously cost them their masculinity. Hanging out with moms, I like the shared feeling (which is never articulated this way) of doing an important kind of work raising the next generation. I do have dad friends, and I appreciate the time together with us and our babies, but often the shared feeling is not a connection over decisions we’ve made about our lives as much as it is giving a woman a break — trying to restore some balance in a household. Unlike the woman at the party who’s bored by “family-model” talk, I like to talk about ours, obviously. Not only are we proud of having designed and sustained something that’s proven so adaptable, but it also provides a lens through which to see our place and time, and the people we live among. Michael Erard is a linguist and author of Babel No More: The Search for the World’s Most Extraordinary Language Learners, which will be published in 2012 by Free Press/Simon & Schuster. He’s written about language for the New York Times, Science, Wired, the New Scientist, and many other publications, and is a contributing writer to Design Observer. This is the first post in a series Michael will be writing for Role/Reboot about how he and his wife have reinvented their role as parents, partners, and breadwinners, and what their household model looks like now.